An ancient and curious tree, the Chilean Pine has been fascinating people for generations. 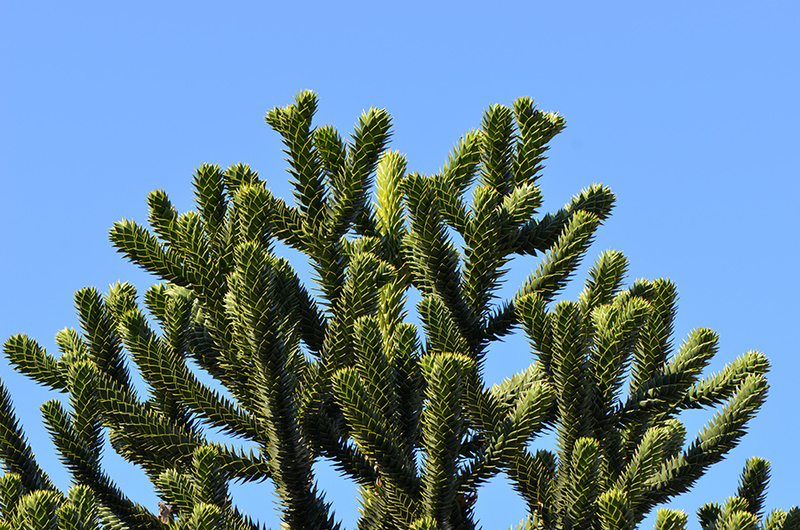 Of course you might be wondering what a Chilean Pine is – it’s best known by the name Monkey Puzzle tree, which itself is something of a conundrum as there are no monkeys in its natural habitat. The monkey puzzle tree is most at home clinging to the sides of mountains, particularly volcanoes. What’s particularly interesting about this is that the bark of the tree is resistant to fire, meaning clusters of them can actually survive lava flows. Usually found at around 3,300 feet above sea level and higher, this gives a good indication of the type of conditions the tree prefers – although, in good news for gardeners, it is not especially picky. The monkey puzzle tree is usually happiest in well drained and slightly acidic soil, with volcanic soil being the best. This said they are remarkably unfussy and can be grown in domestic gardens without much difficulty, just as long as you’re not affected by high levels of pollution. They don’t take kindly to it. Plant one in the right spot, though, and you’re in for a treat. The monkey puzzle has a lot of growth potential. Many conifers can reach skywards dramatically and this one is no exception, with mature heights of 40m (130ft) not uncommon, but it does take a while to get there. These are slow growing trees, that are unlikely to even start fruiting before 20 years of age, but they make up for it with a very long lifespan; when you plant one in your garden you are planting a tree that will last for generations – anything up to a thousand years. The species itself is even more long-lived; these remarkable plants have been around for 200million years. Its spiny leaves are thought to have evolved to protect the tree from grazing dinosaurs, which is perhaps why we are lucky enough to still have them gracing our landscapes today. Like many conifers the monkey puzzle bears cones on distinct male and female trees, but infrequently some trees will produce both sexes of fruit. The male cones take up to two years to mature and are almost five inches long when ready to release their pollen. Cylindrical in shape and resembling a burnished red cucumber, they are easy to tell apart from their female counterparts which appear a year and a half after pollination. These are very large and globular, and by the time they’re ready to release their two-inch seeds these pods are almost eight inches in diameter. Each female cone will release 200 seeds into the environment as the casing breaks down and disintegrates. With seed numbers like this you might imagine that the monkey puzzle tree would have no trouble surviving. Sadly this is not the case, and in 2013 they were declared an endangered species. This is due mostly deforestation and the desirable commercial qualities of their wood. Although commercial felling of these trees was banned in 1990, there are still cases of illegal logging reported today. The seeds have long been used as a food source and this practice has also impacted the trees’ ability to survive. As if these problems weren’t troublesome enough a vast number of trees have been destroyed in forest fires, including many in the early 21st century. This might be surprising given their ability to withstand lava flows but it is the bark itself that is resistant, and thanks to their oil rich leaves they burn relatively easily if the fires are large enough. Sadly, national parks that suffered large fires lost some ancient specimens that were over 1,300 years old. However there are planting projects underway that should prevent further decline. It seems only right to end by answering the question of how the tree came by its familiar name. The natives of Chile call it Pehuén, and for those people it is a sacred tree. It was discovered by western biologists in the 1790s and not long afterwards examples were being planted in English gardens. One proud owner was Sir William Molesworth, who grew a fine specimen at his Cornish home, Pencarrow House. On looking at its striking spiked leaves his friend Charles Austin remarked, “It would puzzle a monkey to climb that.” Mr Austin’s comment stuck, and that’s how the monkey puzzle tree got its name. 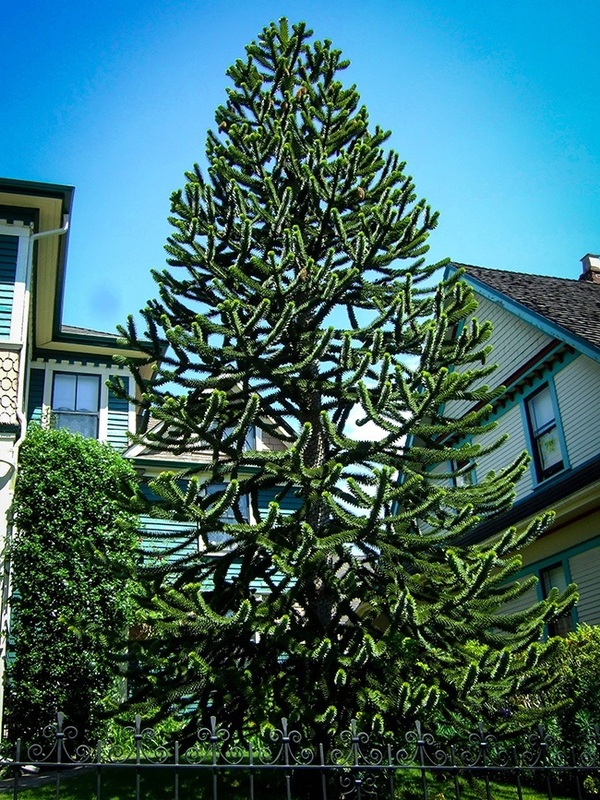 I have loved the Monkey tree since growing up in Aberdeen, Washington. Our neighbors had one and I just loved it. Probably the only tree that I could recognize as a child. Now in my 70’s I finally have one of my own. We have picked a spot to plant it and give me a view of it from my favorite chair, I just love it, Thank you Susie for the best Xmas gift ever!